A gap in Australasia’s marine evolutionary record has been filled by a group of sea cow fossils recently identified by museum scientists as the oldest ever found in the region. The 12-million-year-old fossils were discovered in a cave under the remote central highlands of New Guinea more than 30 years ago, but remained unstudied. Last year, they were rediscovered in a museum drawer by scientists from Museum Victoria and the Smithsonian Institution, who immediately found the fossils curious. Dr Fitzgerald says the fossils provide a vital perspective on the relationship modern sea cows have with Australia’s northern marine ecosystems. Until this drawer of fossils was studied, it had been thought that sea cows were fairly recent arrivals in Australasian waters and that these grazers and their relationship with sea-grass ecosystems around Australian waters was also recent. This new research suggests that these gentle giants have been an important part of Australasia’s marine ecosystems for at least twelve million years and that their role in the long-term health of these environments may be very significant. Everything Dinosaur is grateful for the Museum Victoria for their assistance in compiling this news story. Sources at the Institute of Vertebrate Palaeontology and Palaeoanthropology (IVPP) in Beijing, China have reported the discovery of a large number of dinosaur fossils at a site in Laiyang City, in Shandong Province (East China). Over 130 fossils including fossilised egg fragments and large dinosaur bones were unearthed at an excavation adjacent to the village of Jingangko. Fossils were first discovered at the site back in 2010 and palaeontologists working for the IVPP have stated that many of the fossils are in an excellent state of preservation. Field workers have sealed off the fossils and their exposed matrix with gypsum to protect them before the site can be properly mapped and formal excavation work begun. Amongst the many fossilised bones the researchers have already recovered is a sixty centimetre long humerus (upper arm bone). The strata is particularly rich in fossil vertebrates and this latest excavation is one of a number going on in the area as palaeontologists have already unearthed many dinosaur fossils from at least twenty different layers of strata. Two years ago, the Chinese state set up the Laiyang region as a national park for dinosaur fossil remains. The enormous amount of dinosaur fossils in Eastern China. The picture above shows acclaimed Chinese palaeontologist Xing Xu amongst a bone bed of Hadrosaur fossils. Shandong Province has been regarded as one of the most important dinosaur sites discovered in the last one hundred years or so. A number of important discoveries have been made, including a new genus of Tyrannosaurid and in 2010, Chinese scientists uncovered the fossilised remains of a new genus of large horned dinosaur which was named Sinoceratops zhuchengensis. Regarded by many scientists as possibly the largest fish of all time, the filter-feeding teleost Leedsichthys is known from just a few fragmentary remains. With a skeleton made from cartilage, a material that has a poor preservation potential, scientists have struggled for more than a century to try to piece together data on this immense bony fish. The specific name for Leedsichthy is L. problematicus, which reflects the problems palaeontologists have had in interpreting the fossil evidence. After all, it was once suggested that fossils found in eastern England and now ascribed to Leedsichthys belonged to an armoured dinosaur. A new study carried out by scientists at the University of Bristol in collaboration with the University of Kunming in China have estimated the growth rates of these Jurassic creatures. The research indicates that these animals ranged in size from 12 metres to 16 metres when fully grown. At the top end of this range, Leedsichthys is indeed capable of claiming the title of the largest, bony fish of all time. The animals that occupy a similar niche in today’s marine environment are also of an impressive size, filter feeders such as the Baleen whales, manta rays as well as basking and whale sharks. Occasionally, elements of the cartilaginous back bone are preserved. These parts of the skeleton can become mineralised and thus have a better chance of surviving the fossilisation process. Just like in shark species today, the discs that make up the back bone can show preserved internal rings that permit scientists to estimate the age of the animal when it died and how quickly it grew. Using data from documented Leedsichthys fossil finds, including evidence from a recently discovered specimen found near Peterborough (East Anglia, England), the team estimated that an, adult fish of 8-9 metres would be around twenty years of age. Lengths in excess of 16 metres would have been reached when the animal was around 38 years of age. Scientists are not sure how long these animals lived, but it has been suggested that these leviathans could leave for forty years or more. The project began in Glasgow with a review of the remains of the giant Jurassic fish Leedsichthys, in conjunction with the excavation of a new specimen of this creature (the Peterborough specimen). Professor Liston, who ran the excavation in Peterborough, wanted to explore an anomaly as before Leedsichthys, most vertebrate suspension feeders did not grow much larger than half a metre in length. It seems sometime around 165 million years ago, the ocean’s ecosystem changed, which permitted these large vertebrates to evolve. The researchers also looked at specialist structures on the gills as a means of how Leedsichthys grew so large. Filter feeding seems to have enabled Leedsichthys to grow to a very large size. Its bulk would have made it almost invulnerable to attack, very helpful when you shared the sea with predators such as Pliosaurs, Plesiosaurs and marine crocodiles. Professor Liston had been involved in a related project reported upon by Everything Dinosaur in 2010. The fossil record is so poor for cartilaginous fish that there was a huge gap in the fossil record from the likes of the Middle Jurassic Leedsichthys to the filter feeders known from the Cenozoic. A discovery of a giant, filter-feeding fish of the Late Cretaceous (Bonnerichthys) helped plug what was a 100 million year gap in the fossil evidence. A spokesperson for the police services in the Northern Territory (Australia) has confirmed that the body of a man snatched by a Saltwater crocodile has been recovered. The victim, named as 26 year-old Sean Cole, was attacked by a large four metre plus crocodile as he and a friend attempted to swim across the Mary River during a birthday party. Despite numerous signs indicating the danger of crocodile attacks and warnings from locals, it seems that Sean chose to go for a swim in a river renowned for having one of the highest densities of large crocodiles in the whole of Australia. Sean was celebrating a friends 30th birthday and he another male party goer decided to swim the river, Sean was attacked as he swam back having reached the opposite bank. Onlookers watched in horror as Sean was suddenly attacked. The attack took place on Saturday afternoon, the body was recovered today just a few yards from where the attack took place. In a statement, the police claim that the body was recovered around 5.30am this morning (local time). At least four crocodiles have been shot in the area following the incident, rangers say, including one believed to be responsible for Mr Cole’s attack. The Mary River Wilderness Retreat, just seventy miles south-east of Darwin is a popular destination for tourists and locals seeking a break from the city. As there are a number of large crocodiles known to be in the vicinity there are plenty of warning signs alerting visitors to the potential danger of a crocodile attack. Best to stay out of the river. This latest fatal incident comes at a time when the Northern Territory Department of Land Resource Management has released figures that show that there have been eighteen fatal Saltwater crocodile attacks since the legal protection of the species came into force in 1971. Contrary to popular belief, it is not tourists who seem to be the most at risk from crocodile attacks. Wildlife scientist Yusuke Fukuda, who compiled the report, said sixteen of those fatalities were Territorians (local residents). The data is based on sixty-two confirmed attacks, fourteen of the victims were male. The department’s figures do not include attacks by crocodiles in captivity or when capturing crocodiles or collecting their eggs. The figures also do not include attacks with no reported injuries or unconfirmed attacks such as suspected drownings or missing persons. The data excludes any attacks from the smaller Freshwater crocodile (C. johnstoni). 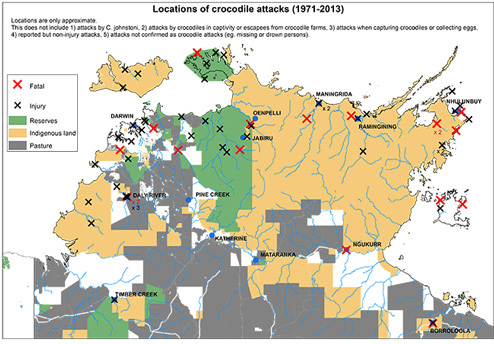 Map of crocodile attacks in the Northern Territory. Reflecting on how the local crocodile population has recovered since hunting was banned, Charlie Manolis, chief scientist at Crocodylus Park, a tourist attraction and crocodile research station in the Northern Territory, commented that during the days of hunting from the 1940s to the end of the 1960s, the Mary River region was one of the best spots to find large crocodiles. By the time the hunting ban came into force in 1971, there were very few crocodiles left in the river system. He went onto add that large crocodiles were regularly seen in the Mary River these days, the vast majority have moved into the river system from other parts of the Northern Territory. Dr. Manolis stated that culling opened the chance for people to get a false sense of confidence of going into the water and urged caution before considering a cull as a method of managing the crocodile population. He also said the consumption of alcohol was a factor in about half the crocodile deaths nationwide. The Pachycephalosaurs, often referred to as the “bone-headed dinosaurs” due to their greatly thickened skulls are a group of Ornithischian dinosaurs known almost exclusively from Upper Cretaceous deposits of North America and northern Asia. Although the majority of this group are only known from fragmentary fossil remains, most notably frontal and parietal bones of the skull, a number of Pachycephalosaur models have been made and this is a review of the Pachycephalosaurus dinosaur model manufactured by Collecta. No complete skeleton of Pachycephalosaurus has been found, so interpretations of this dinosaur, the largest of the “bone-headed dinosaurs” discovered to date, are usually based on a scaled up version of the Pachycephalosaur known as Stegoceras. Collecta have depicted their Pachycephalosaurus in a bipedal pose with strong hind legs, five fingered hands and with a tail a fraction longer than the length of the shoulder girdle to the pelvis, although the actual body proportions are unknown. Skull fossil fragments ascribed to Pachycephalosaurus are known from Canada and the western United States, mainly from the Province of Alberta and the states of Wyoming and Montana. The thickened skull dome is over 25 cm thick on larger specimens, exceptional protection for what was a relatively small brain inside the skull. The model makers at Collecta have elected to give their Pachycephalosaurus a more rounded skull, rather than the very domed shape seen in some reconstructions. The skull dome was edged with a number of bony protrusions and spikes, these were most prominent towards the back of the skull. The muzzle was relatively short and it ended in short beak, in the Collecta replica, the beak is ever so slightly pointed and can be clearly made out on the model. The spikes and bony projections have been painted a bright yellow colour which contrasts nicely with the muted, camouflaged tones of the body. A close up of the lovely detail on the head. The model measures a little over ten centimetres long, although the size of this dinosaur is not certain from the fossil evidence, based on a 4.6 metre long adult animal we estimate that this Pachycephalosaurus is in approximately 1:46 scale. The replica has a row of prominent, triangular spikes running from the base of the skull to the almost the very tip of the tail, a single line of spikes is also depicted on the neck, presumably providing some protection from attack and to protect the soft tissue of the neck when browsing on thorny plant material. The neck looks quite long and stiff. The total number of vertebrae is unknown for any member of the Pachycephalosaur family, indeed how the neck bones articulated with the skull of Pachycephalosaurus is open to speculation. It had been thought that the thickened skulls and stiffened dorsal vertebrae of this type of dinosaur were adaptations for head-butting contests between individuals, although recent studies and biomechanical analysis of the skull domes have led to this form of intra-specific conflict being disputed. This model is supplied on a base, this prevents the feet from having to be oversized and the effect is to depict Pachycephalosaurus as an agile, strong-running dinosaur. The number of fragments of skull bone found in locations such as the Dinosaur Provincial Park Formation of Alberta suggest that Pachycephalosaurs were the most common, small-bodied dinosaurian herbivores in those ecosystems where their fossils have been found. 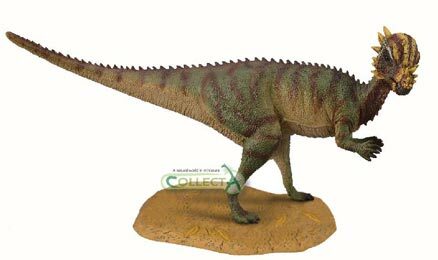 This is a fascinating re-creation of Pachycephalosaurus and an excellent addition to the Collecta range of prehistoric animal models. The Pachycephalosaurus replica and the rest of the Collecta prehistoric life range is available from Everything Dinosaur, the UK based retailer of dinosaur models, toys and games that is staffed by parents, teachers and real dinosaur experts. Horizon, the documentary series regarded by many as the flagship science programme for the BBC is venturing into the world of the dinosaurs once again with a programme dedicated to the remarkable work of Dr. Mary Schweitzer and her colleagues. Scientists have had the fossilised bones of dinosaurs to study and over the last one hundred and eighty years or so much has been learned about these long extinct reptiles, but could there be more than just permineralised, long-dead material present in the fossils of dinosaurs? Could biological material such as cells, soft tissue, blood and possibly DNA from dinosaurs still exist? The hunt for Dinosaurian DNA. On Monday 26th September at 9pm (BST) on BBC2, Horizon will focus on the work of Dr Schweitzer who believes that soft tissues and other organic material has been recovered from deep inside the long, dead bones of iconic animals such as Tyrannosaurus rex. Perhaps the idea of a Jurassic Park such as the one envisaged by the author Michael Crichton will one day be more than fiction, could the research carried out by scientists such as those at the North Carolina State University lead to the resurrection of some members of the Dinosauria? DNA is deoxyribonucleic acid, a molecule of genetic material that determines the inherited characteristics of most living organisms. The vast majority of examples of the DNA molecule consist of a double helix made up of two long chains which are made up of nucleotides, these in turn are made up from 4 proteins referred to as nucleobases (thymine, guanine, adenine and cytosine) represented by the letters T, G, A, and C. Almost every cell of every organism from many viruses, amoebas, dinosaurs and humans has its own set of molecular instructions. The function of each cell is encoded in the chromosomes, these carry the hereditary data in the form of genes. On this blog, team members at Everything Dinosaur have reported on a number of studies that claim that organic material has been recovered from the fossil record, although many scientists have been sceptical about such research. Mary made the initial discovery of T. rex soft tissue remains back in 2005, since then she has argued that organic material may actually be relatively common in well-preserved, robust fossils, but since very few people expected to find such material, it has been rather overlooked. Mary and her team are not alone when it comes to exploring the soft tissues of extinct animals. Montana State University has pioneered research into ancestral DNA through the study of bird embryos, confirming a now, well established view that Aves (birds) and the Dinosauria, especially Theropoda are very closely related. One of Dr. Schweitzer’s co-authors on a number of soft tissue studies, Assistant Professor of Medicine at Harvard Medical School John Asara agrees with Mary, that there may be more organic material awaiting discovery. He has been working on a number of projects related to the study of fossilised proteins, which have reaffirmed the dinosaurs close affinity to the birds. To read a short article on this work: Are You Going to Call T. rex Chicken? A number of scientists and other academics have challenged these studies. It had been thought that DNA could not survive more than 10,000 years. It, like all other organic material would be rapidly degraded and broken down unless it was subjected to a very unusual manner of preservation, such as being entombed in ice, for example in the case of Woolly Mammoth remains from Siberia. In 2012, Everything Dinosaur reported on a piece of highly controversial research carried out on the fossilised bones of the Moa (a giant, flightless bird that once inhabited New Zealand). Analysis of the robust bones of three extinct species of New Zealand Moa by a team of international researchers led to the publication of the estimated half-life of DNA. Under the very best conditions for preservation, it was calculated that the proteins that make up DNA could persist in the fossil record and permit detectable traces still to be found in fossils as old as 6.8 million years. Still to recover DNA from a Tyrannosaurus rex would require DNA to remain preserved, uncontaminated and viable for nearly ten times as long. After all, the last T. rex went extinct around sixty-five million years ago. Could what the suggests have found preserved in the fossilised bones of dinosaurs, be organic material from another source? Tests have shown that some of the material recovered reacts in the same way as organic material from birds. Is there contamination? How can the delicate organic material such as blood, collagen and proteins be preserved for so long? Do the tiny, microscopic fragments recovered really represent organic material from a long dead dinosaur? Intriguingly, animals very far removed from Tyrannosaurus rex have lent support to Schweitzer’s and Asara’s claims. Researchers from the University of Copenhagen (Denmark), co-authored a paper that was published in the journal “Nature” about a study to sequence a portion of the ancestral horse genome from an equine fossil that was more than 700,000 years old. The research dramatically extended the limit for viable DNA survival in the fossil record. Recently, a fragment of a tibia (lower leg bone), recovered from 3.5 million year old deposits on Ellesmere Island (Canada) was proved to belong to an ancient camel, thanks to collagen finger printing carried out by University of Manchester scientists. 700,000 year old genetic material recovered from a fossil bone. The horizon programme will focus on the research into dinosaur DNA, however, the implications of this soft tissue recovery will have far reaching consequences and may well lead to a reappraisal of what we do and don’t know about a whole host of extinct fauna.